i don't know that there has ever been a better marriage than that of chocolate to peanut butter. it definitely has stood the test of time..
and yes.. i just spent a good 5 minutes figuring out how to stick that dig in there. i hate reality tv, and it annoys me that people are famous for NOTHING. but, like i was saying. & proclaiming it to be the pans fault. yep. i blamed the pan. because i didn't have a 9x13 which is what the recipe called for. i also may have claimed his favorite brownies would be thicker if i had the right pan. 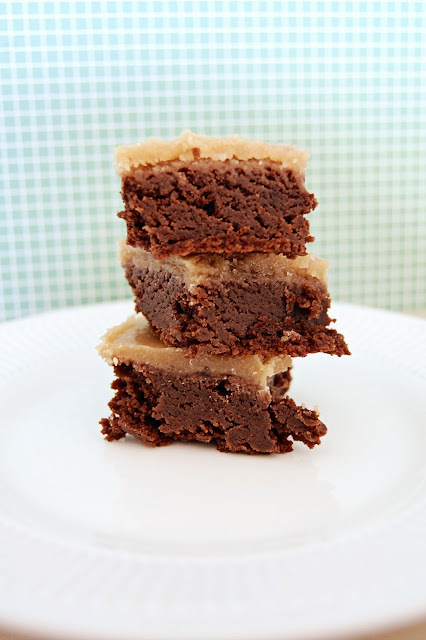 the brownie recipe is from a scrapbooking friend. she has been blessing us with her AMAZING brownies at our retreats for a few years..
and they are always irresistible. i begged the recipe off her because i knew the hubs would be in heaven. she uses all top of the line goods in hers, which make them divine..
but i use good ol' hershey's cocoa & the hubs is still in love with them. the peanut butter icing recipe is from that southern charity cook book i have in my possession. & certainly eaten up at a fair rate..
it was a little too much peanut butter in one bite for our taste..
2. mix all ingredients together until well blended. pour into 9x13 pan. 1. mix sugar, milk, shortening, butter & salt in a small saucepan over medium heat. 2. stir constantly to prevent scorching, until mixture comes to a rolling boil. 3. once boil starts, allow to boil for 1-2 minutes WITHOUT stirring. 4. remove from heat & immediately add vanilla & peanut butter, stirring until smooth. 5. pour over cooled brownies & let set. i managed to come out only spending $26, which is the most i've ever spent there at one time..
but certainly not what i COULD have spent! then dinner last night with my brother & his wife at an amazing little greek restuarant in orlando. off to start/finish our gifts for family! Oh my, this looks decadent. I know my son will flip for these! Thanks for sharing the recipe. First, way to go with the pan, we have to justify new baking things somehow. And secondly these look amazing!